Where do I begin... Okay, lets start by saying that the staff seem friendly enough but the real problems are to do with their billing practise. On two separate occasions our repair shop had Hertz sort out a rental car for us, each time the staff member clearly told me to not fill up the fuel if I wanted and they would top it up when I returned the car and they would bill me a reduced-price-per-litre fuel charge for however much fuel was required to top it back up. Now looking at the bills what they have done is tacked on something called a Fuel Purchase Option (FPO) which charges me for an entire tank of gasoline even though we drove less than 100km. They were blatantly dishonest and misleading about this. I also had to request copies of my receipts from Hertz to understand how this all worked since they did not provide this completed information automatically. Secondly, I later found out that the repair shop I went too also had many issues with Hertzs billing practise and were holding back on paying invoices, including mine, so Hertz charged both of the entire rental charges to my CC because they had my CC number from the damage deposit. They did this about 2 months after the rentals occurred, obviously after they failed to collect from the repair facility. The invoice clearly states that the charges should be billed to the repair shop, not myself. The way they operate is verging on criminal activity and it is probably best to just steer clear of this business. Do not put your entire trust with these people. Take a picture of your car and ALL the gauges-especially the fuel gauge before returning the car. Print it and nail it to their foreheads. I had an unfortunate experience where after I had returned the car with the correct amount of gas, which when hired out to me was at half a tank so a half tank they received, I found out days later they had charged me for the remainder on my credit card despite having cleared it with the attendant. I had to lodge a complaint with Hertz Customer Service in order to receive a full refund. It was pretty much theft and though I phoned the Hertz people from the location I rented the car from and having spoken to exact same person that checked out the car asking why I was charged despite the ‘all clear,’ I was told that he didn’t agree so charged me anyways. When I said I would complain, he didn’t care-he said go ahead and hung up on me. Nice way to treat a local who is a new mother. I rented a car in July to drive from North Vancouver to Osoyoos for a family reunion. I had to pay tolls as I drove over the Port Mann Bridge. I made this payment the day after I returned. Now, in October, I have received two notices from Hertz alleging I did not pay the tolls. I have the receipt from Treo and the payment is recorded on my VISA statement. According to customer service at Treo I should have let the Hertz customer service dept. know that I had paid this. This is an important piece of information that is omitted by Hertz. This should all have been resolved in-house. There is something wrong with their accounting and reconciliation systems and thus their customer service. I deeply resent having to resolve this issue for them. I was unable to actually speak to anyone who would discuss this with me. Horrible. Employee named clark Liu said on phone all I need is DL and credit cardr and is be good. I had my girlfriends credit card. Took a 40 dollar cab and when I arrived I was told he specifically said it had to be the same as the drivers licence name on the credit card on the phone call which he did not, and that he was sorry and I guess in just boned.... Manager is Clark Liu. I was asked to going in to Hertz car rental the day after I returned the car as they all edged I had scratched my cars hub cap. I asked to see car but they had already rented it out. I asked then how much it would cost to replace and they said they did not know. The woman at the counter was very rude and raised her voice when I asked questions. Unpleasant experience. I always use North Van branch most of weekends and all the staff are there are really nice friendly and kind. Andrew, Koushan, Clark, and Sandra They have fast process and respect me. Great customer service. Plus they also have great quality of cars and many choices. 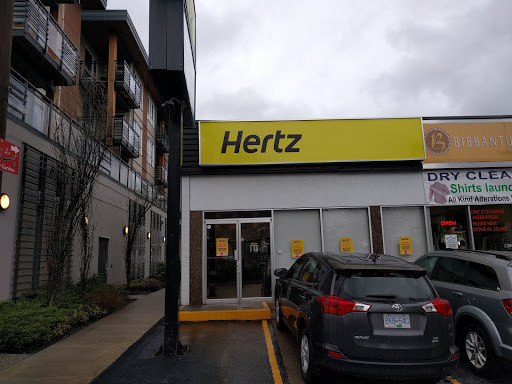 I am always happy to rent a car with north van hertz. Highly recommend this branch! Great staff. Kousham went distance to satisfy my needs. Its a small office, but extra busy as it covers all ICBC claim rentals in the neighbourhood, but everybody tried their best to serve customers as fast as possible. Staff is unprofessional and lacks organizational skills. Unable to return phone calls, very unhelpful (seems like no one likes to be working there and doesnt care about customer service at all). Gunjan was the lady that rented out a car for us. She was pretty friendly, gave us transparency and made us a very good contract. Thanks for that! Was an idiot and left my glasses in a car I rented. They tracked them down and helped me out. Thanks Raj and Andrew! Will return. staff isnt helpful I called in 5 times to be told I would get a call back the following day by a manager never happend. Did not keep our reservation. Then we were overcharged!